Abstract: John Rawls's most mature notion of political order is “stability for the right reasons.” Stability for the right reasons is the kind of political order that Rawls hoped a well-ordered society could ideally achieve. In this paper, I demonstrate through the tools of modern game theory, the instability of “stability for the right reasons.” Specifically, I will show that a well-ordered society can completely destabilize by the introduction of an arbitrarily small number of non-compliers whenever individuals fail to achieve full common knowledge ever so slightly. Abstract: According to telling based views of testimony (TBVs), B has reason to believe that p when A tells B that p because A thereby takes public responsibility for B's subsequent belief that p. Andrew Peet presents a new argument against TBVs. He argues that insofar as A uses context-sensitive expressions to express p, A doesn't take public responsibility for B's belief that p. Since context-sensitivity is widespread, the kind of reason TBVs say we have to believe what we're told, is not widespread. Peet doesn't identify any problem with his own argument though he does attempt to limit its sceptical potential by identifying special contexts in which TBVs stand a chance of success. A more general defence of TBVs can be provided by showing Peet's argument to be unsound. I argue that Peet's argument is unsound because it requires us to wrongly suppose that speakers do far less labour than their audiences in context-sensitive linguistic communication. I aim to show why – in the context of the epistemology of testimony and the philosophy of language – it's important to recognize the labour that speakers can do, and so can be held responsible for not doing, in episodes of context-sensitive linguistic communication. Abstract: The “Evidentialist Dictum” says we must believe what our evidence supports, and the “Fallibility Norm” says we must take our fallibility into account when managing our beliefs. This paper presents a problem for the Evidentialist Dictum based in the Fallibility Norm and a particular conception of evidential support. It then addresses two novel Evidentialist responses to this problem. The first response solves the problem by claiming that fallibility information causes “evidence-loss.” In addition to solving the problem, this response appears to explain what's wrong with certain illegitimate dismissals of misleading evidence. However, this explanation opens it up to objections. Next, I consider and pose challenges to an Evidentialist strategy that attempts to solve the problem by converting accounts of fallibility's epistemic significance for rational belief into principles of evidential support. I conclude by sketching a solution that allows us to capture what's true in the Evidentialist Dictum and the Fallibility Norm. Abstract: Robert Roberts and W. Jay Wood (2007) define intellectual humility as a dispositional absence of concern for self-importance. And they contrast this virtue with distinct species of vicious pride. The aim of this project is to extend their regulative epistemology by considering how epistemic agents can cultivate a dispositional detachment from the concerns characteristic of the prideful vices of hyper-autonomy and presumption. I contend that virtuous communities help to foster intellectual humility through their role in cultivating the virtue of hope. Thus, regulative epistemology ought to focus greater attention on the role of communities in the development of intellectual virtue. 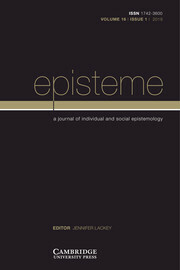 Abstract: In this paper, I identify a form of epistemic insensitivity that occurs when someone fails to make proper use of the epistemic tools at their disposal in order to bring their beliefs in line with epistemically relevant evidence that is available to them. I call this kind of insensitivity agential insensitivity because it stems from the epistemic behavior of an individual agent. Agential insensitivity can manifest as a failure to either attend to relevant and available evidence, or appropriately interpret evidence that is attended to. The concept of agential insensitivity allows us to conceptualize the kind of not-knowing involved in forms of ignorance that are cultivated and maintained by individual agents, especially when this ignorance is enabled or encouraged by social structures. I use the skepticism about racial disparities in policing practices that is displayed by many white Americans as a lens for exploring this connection. Understanding agential insensitivity thus provides insight into both social and epistemic phenomena. Abstract: One challenge for moderate invariantists is to explain why we tend to deny knowledge to subjects in high stakes when the target propositions seem to be inappropriate premises for practical reasoning. According to an account suggested by Williamson, our intuitive judgments are erroneous due to an alleged failure to acknowledge the distinction between first-order and higher-order knowledge: the high-stakes subject lacks the latter but possesses the former. In this paper, I provide three objections to Williamson's account: (i) his account delivers counterintuitive verdicts about what it is appropriate for a high-stakes subject to do; (ii) the high-stakes subject doesn't need iterated knowledge in order to be regarded as appropriately relying on the relevant proposition in practical reasoning; (iii) Williamson's account doesn't provide a good explanation of why the high-stakes subject would be blameworthy if she were relying on the relevant proposition in her practical reasoning. Abstract: Infinitism, in contrast to foundationalism and coherentism, claims that justification in any proposition requires the availability of an infinite chain of propositional reasons, each providing a justificatory reason for its successor in the chain. Both infinitists and some critics of the theory have at times noted the possibility that the theory may have sceptical consequences for doxastic justification. It is argued here that, for reasons that appear not to have been previously appreciated, sceptical results very definitely do follow from infinitism. On one construal of infinitism, this constitutes a reductio of the theory. On an alternative construal, infinitists may embrace the sceptical conclusion, but in doing so, will take on all the problems that scepticism faces.